We can supply racks to suit most manufacturer’s freezers, optimised to store the tube racks, and plates that you are using. Our high quality racks and drawers simplify your work. The samples are clearly arranged in the refrigerator or freezer and are always easily accessible because all drawers can be individually opened. In contrast to horizontal racks, which are loaded from the side and therefore have to be completely removed, the drawers can be opened separately to access a specific rack. The drawers have a gripping edge on the front, which can be used even wearing special gloves. The bottoms of the drawers are closed to store small racks or sample containers too. We can also provide you with drawers with a folding handle or an opening in the bottom. Closed side walls are possible as well. Please contact us to receive a particular quotation. 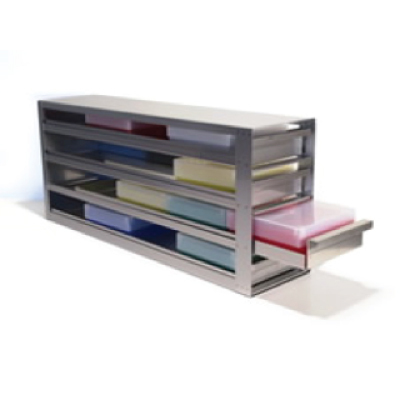 All horizontal drawer racks can also be ordered with a pull-out stop at no extra cost. The pull-out-stop prevents the drawers from being unintentionally pulled all the way out of the horizontal rack. But please note that because of this pull-out stop the drawer racks will be a little bit higher than the racks without this stop. Therefore you have to check if the drawer racks will fit into your upright freezer. If you need help for this, please contact us. If you need a particular rack, please send us your request. We will be pleased to send you a quotation.